For updates and more releases!!! Find out what happens when you fall in love with DANGER!! 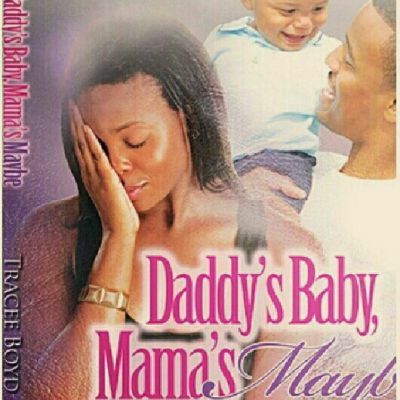 Check out my new Author's latest book "Daddy's Baby, Mamas Maybe" This book is one word-->FIRE!!!!! 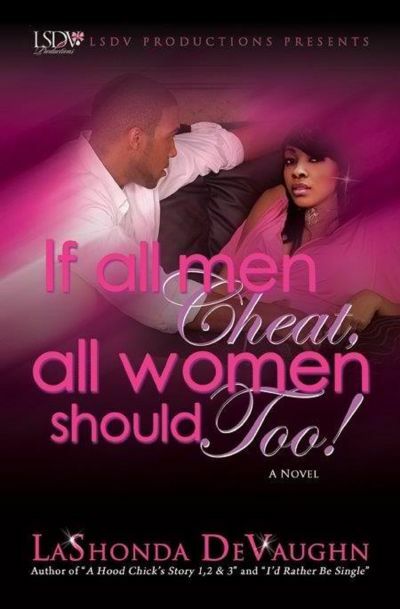 "A HOOD CHICK'S STORY 3: The FINAL CHAPTER"
"A HOOD CHICK'S STORY I"
"A HOOD CHICK'S STORY II"
"A HOOD CHICK'S STORY 3"
TITLES ALSO AVAILABLE ON AMAZON KINDLE, B&NOBLE NOOK & PAPERBACK!!! "I'd Rather Be Single!!!" With stories by LaShonda DeVaughn, Mimi Renee, Tysha & Kaie Golson...with STEAMY & EMOTIONAL STORIES that'll have you glued to the pages!!! Tyra went from dating deadbeats to dating athletes. But living the good life came at a price…. They say in order to receive true and real love, we must all take chances. Will Kenneth end up being the real deal? Or will Rita end up regretting her decision in courting a young thug? 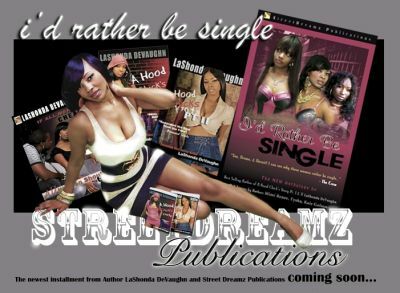 Check out LaShonda's interview with On The Rise Magazine here..
She said she'd be back and Miss LaShonda DeVaughn has proven that fact with A Hood Chick's Story Pt. 2!! For starters, Tony isn't the man she thought he was or is he? Friends start to re surface from the hood and seem to be grown up. But in reality, they never did grow up and begin to bring the Hood back into Tiara's life. Family ties are still broken and possibly severed. Hood Chicks Story Pt.2 is filled with so many emotions from laughter to pain to anger that eventually leads to a devestating event that will have you crying like a new born baby! Drama still seems to be Tiara's best friend. Five years has came and gone and Tiara tries desperately to bury her past baggage and focus on the future of raising her daughter. She tried patching up old wounds by blocking them out. Little did she know, it would all come back to haunt her. Her boyfriend Tony was sentenced to five years in prison but was released after serving only three years. Out for only two years, he tried helping Tiara and their child settle into a better life outside of the projects. 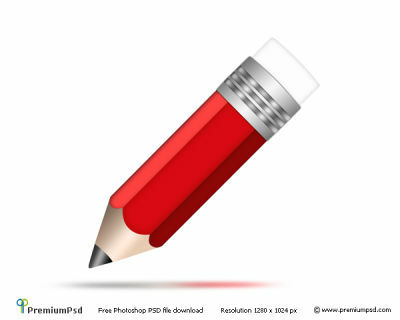 But when his true colors surfaced Tiara finds herself stuck without a plan B. 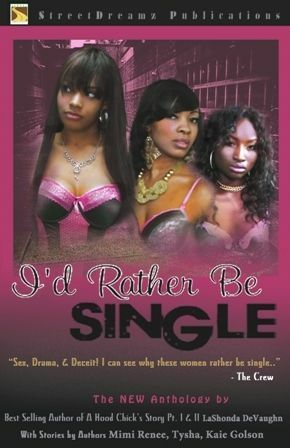 Cheating, lies, abuse and phony friends surround Tiara once again and she finds herself helpless. Will she finally find a way out of her constant cycle of dilemma's or settle for the same ole' street life? Continue to ride along on Tiara's journey through adulthood; find out if the madness ever ends. Drama is no stranger to Tiara James. When it felt like the world had finally changed the hand that she’d been dealt, reality continued to creep up on her. With a mom on the verge of becoming an alcoholic and an alcoholic crack-addicted father who use to beat her mom in front of her, who could blame Tiara for finding a family on the streets. Tiara’s loyalty to her friends was undeniable. The crew consisted of, Tiara, Tamika, Shavon, Renee, Ke Ke and Karen. They jumped, robbed and fought other girls who stood in their way. When trouble surfaced, the crew had no problems with getting their hands dirty. Tiara was faithful to her crew handling any drama that presented itself. But when jealousy get’s the best of friends, things continued to get ugly. With an older brother Tre James wrapped deeply into the streets becoming a drug dealer at 13, their younger brother Sharod had no choice but to admire both Tre and Tiara’s lifestyle. Tragedy continued to hit home and Tiara’s life continued to go down hill. She lost people who she loved and trusted the most to death, jail or betrayal. From welfare, section 8, jail, drugs, abusive relationships and lies, Tiara’s future seems uncertain. Will she finally rise above the drama that meets her at every corner, or remain trapped in the jaws of the hood? Brace yourself as Tiara James takes you on a rollercoaster ride in her footsteps, in her hood, telling her story.